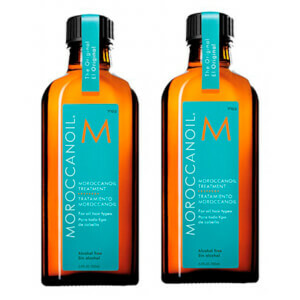 Moroccanoil Light has been developed for those with finer or blonde hair. It has a finer consistency and offers the same amazing results for those with delicate, finer textured hair without the possibility of colour staining. Moroccanoil has a unique quality that instantly absorbs into the hair, creating immediate shine and long term conditioning benefits without leaving any sticky residue. Moroccan oil is not as popular as it used to be now there are so many other treatments that give the same or better results. I have gone back to using this after keratin treatments as it is more affordable and gives similar results to my hair. It has a beautiful smell and feel and is so easy to use. I have tried many oil treatments over the years but this is the best by far. It has a nice subtle smell, tames frizz and doesn't weigh your hair down like many oil treatments do. Don't be put off by the price - it might seem expensive but it's actually great value for money as you only need a small amount so it lasts for ages. I love this product. Its like a light oil free serum. It soften your frizzy hairs as well as increase the volume. I have been using Moroccan Light Oil Treatment for some time now and I absolutely love it. It is perfect for my blonde curly hair to keep it moisturised and under control, and I use it every day without any buildup or greasiness.